The view outside of Dominion Lending Centres on Feb 4th 2019- it’s so cold the air is frozen! Call us from home, you don’t have to go outside! Call us from home, you don’t have to go outside to get a mortgage! Here at HT Mortgage Group, part of Dominion Lending Centres in Grande Prairie, we understand. Call us from home, you don’t have to go outside to get a mortgage! Just call our office at (780) 513-6611. We are having a terrible coldsnap this week, Environment Canada even issued an Extreme cold warning for Northern Alberta. As I write this is it -36 C, but with Windchill it could dip as low at -47 C! Don’t risk getting frostbite, stay warm and call us from home! Yes you can even send documents electronically! Nowadays, you can send us payslips, T4’s, tax receipts and other income paperwork electronically. We use a secure documents portal to protect your confidential documents. You can ask your realtor to send over your purchase agreement and your MLS listing to us as well! Call us from home, you don’t have to go outside when it’s this cold! Our office is open Monday to Friday from 9am to 5pm – and we do have staff who are here, braving the cold everyday – if you like going outside in this weather. Our Keurig is ready to serve hot coffee to any intrepid customers who do visit us today! Jill the office manager at HT Mortgage Group in Grande Prairie, goes outside even when it’s cold – here she is at O’brien park with a friend collecting snowflakes/ Litter from the trail. I’d also like to point out that 7 year fixed mortgage rate – it’s very tempting! Recently lenders have been dropping rates little by little, but for the security of knowing exactly what I’d pay for the next 7 years I would be tempted by that 3.64%. Am I sure I won’t want to refinance my house to fund reno’s in the next 7 years? In conclusion, although 7 year rates provide a lot of security… they are really only suitable for you if you are very settled and content with the home you live in. Did you know when you go to a national search engine like ratehub or ratefinder – they will show rates that may not be available to you? Maybe you need to live in a Large center like Calgary or Edmonton to qualify, or maybe that rate just doesn’t like contract income. It’s always better to search mortgage rates with a local company who knows what lenders will accept in your local community – because yes, the do change how they treat borrowers depending on where you live in Canada! Give us a call today (780) 513-6611 to discuss what mortgage works best for you! 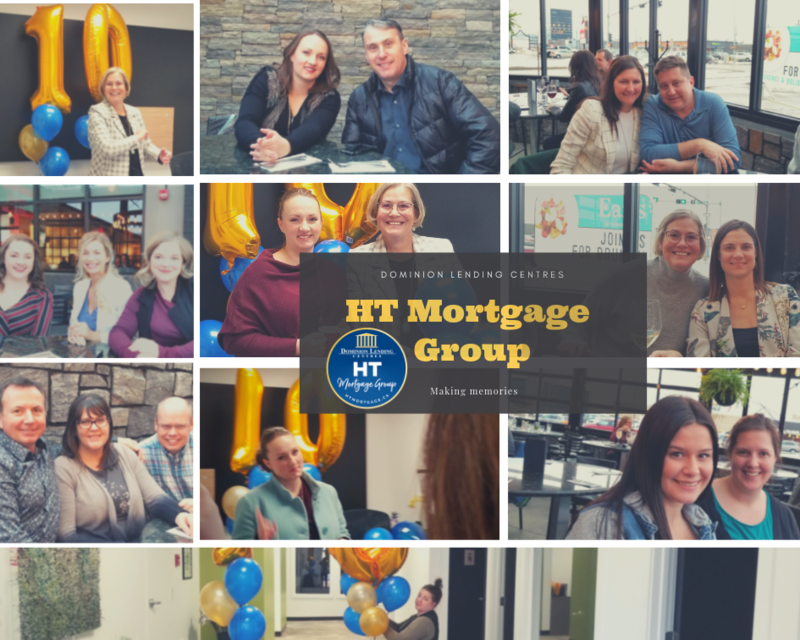 Celebrating 10 years – HT Mortgage Group has been part of Dominion Lending Centres for 10 years now! January 2019 Megan and Pam have been with HT Mortgage Group for 10 years now! With the Bank of Canada in a mood to raise rates, it’s a similar feeling for the bond market, which impacts fixed rates. 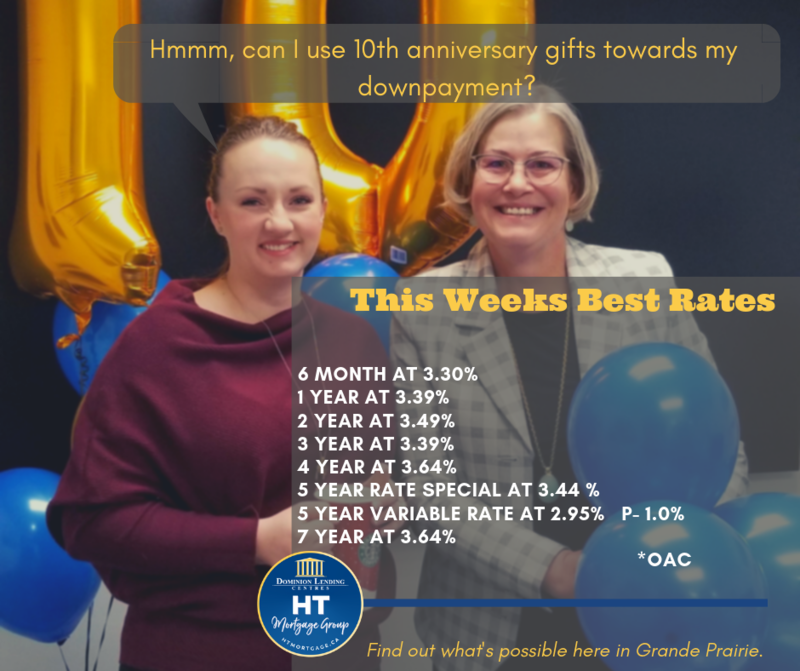 In every interest-rate market there are many factors leading to an increase and we are hoping to provide a little bit of clarity on what is happening and what it means to you and your loved ones. We tell you this in advance to be proactive to take care of you, as our mortgage family, so as you hear the news about the changes you have comfort we are here to lead with clarity. At this time, we see fixed rates increasing as the bond market increases. Review your lock-in options by contacting us or your lender directly (every lender has different policies in allowing us to help or not). Knowing it’s unlikely the prime rate will reduce and fixed rates are on the rise, there could be a sweet spot to review your options now. Locking in won’t be for everyone, especially if you are making higher payments and your mortgage is below $300,000, which most people fit and will continue on that path. Also if your discount is more than .6 below prime you may want to wait and watch the market. Locking in will be around a 1% higher rate than you are likely presently paying. If knowing you can likely lock in around 4% now is most attractive to you, this may be your time. Keep in mind that if you or someone you care about has an average mortgage of $350,000 and got it a few years ago at 2.49% now a qualified applicant can expect about 3.89% which is a payment increase of $254 dollars a month, so increasing your payment now will protect your equity, and you from future payment shock. Angela is part of DLC Angela Calla Mortgage Team based in Port Coquitlam, BC. In recent years the government has made it tougher to get qualified for a mortgage. Our staff here at Dominion Lending HT mortgage group in Grande Prairie are here to help. The most recent change took effect May 9, 2018 so take a peek at the link below to understand a little more about the recent changes.